Is a raw food vegan diet the only way to eat raw? What are your options on a completely vegan raw food diet? Is the Raw Food Diet Mostly Vegan? A lot of people assume that if they are to follow a raw food diet, their food choices will consist of mostly fruits and veggies with zero consumption of animal products. While this may be true for some raw food eaters, it is definitely not true for all. Many people end up eating mostly vegan on a raw food diet, whether that is an intentional, conscientious choice or not. But you should know your options of all of the raw foods available out there, so that you can create the diet that best suits your body’s unique needs, and so you will not get bored from a perceived lack of choices. What Foods are Available on a Raw Food Vegan Diet? Some people have an image in their head that a raw food diet means that they will be confined to eating only bland lettuce and some carrot sticks for the rest of their life. That could not be further from the truth! 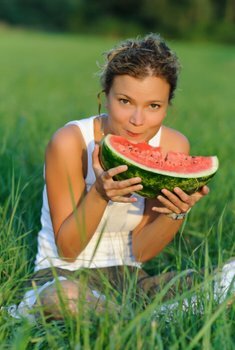 In fact, many raw food eaters claim that they eat a much larger, diverse variety of foods since starting a raw food diet. How many people in the world do you know that eat the same cereal every morning, washed down with the same coffee and cream, then rotate a dinner menu between the same 4 or 5 dishes that they always make? Or they stop at the same lunch place day after day? Honey is an animal product that can be consumed and enjoyed by raw foodists who are not following a strictly vegan raw food diet. Be aware that most of the honey found in grocery stores is not raw. It has been flash heated during pasteurisation, followed by fast cooling. It’s then filtered so that yeast cells are killed, it is more consistent in texture and easier to package. But when honey is heated, its delicate aromas, yeast and enzymes which are responsible for activating vitamins and minerals in the body system are almost completely destroyed. Raw honey, on the other hand, is a healthy option to integrate into your raw food diet. Do I Have to Eat a Completely Vegan Raw Food Diet? So, not all raw food diets are completely vegan. You could try experimenting a little between a vegan diet and a raw food diet that incorporates a number of animal products to see how your body responds. Some people find that the extra protein from animal products helps them to maintain weight and to keep from running chilly, which is one of the issues people on a raw food vegan diet occasionally complain of. Listen to your body, and remember that whether you choose to incorporate animal products or not into your raw food diet, there is a never-ending assortment of healthy raw foods out there for you to nourish your body with.